Above: Jim Peters entering the Polytechnic stadium at Chiswick to set a new world marathon record, from the cover of the 1993 race programme. The year the picture was taken is uncertain but was probably 1953 or 1954. Below: Arthur Keily with the Sporting Life Trophy at the race finish in 1960, as seen on the cover of the 1992 race programme. Arthur won in a time of 2:19:06, making him the second Briton to break 2:20 for the marathon. With time, some of those achievements will be overtaken, but the place of the Polytechnic Marathon in athletics history will remain. The second question is easier to answer than the first. The Polytechnic in question was the Polytechnic in Regent Street, London, opened by Quintin Hogg in 1882 and now known as the University of Westminster. The Regent Street Polytechnic had an athletic club, Polytechnic Harriers, which in the early 1900s was probably the leading club in the country. When the Olympic Games came to London in 1908, organization of the Olympic marathon was placed in their hands. In those days, there was no set distance for the marathon – it was just a very long race, around 40 km (25 miles) in length. 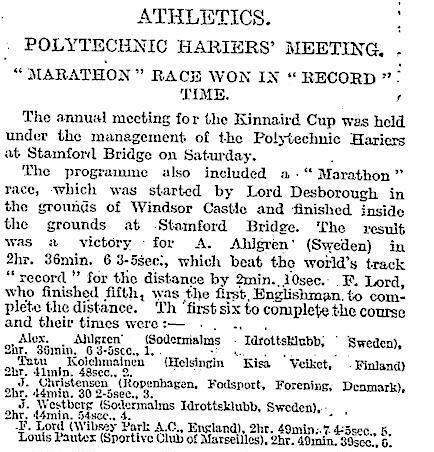 The Polytechnic Harriers decided to start the Olympic marathon in front of the Royal apartments at Windsor Castle and end it on the track at White City stadium in front of the Royal Box. (For a map of the course, laid out on modern roads, see here.) The distance turned out to be 26 miles 385 yards, although it must be said that measurement standards of the day were not as accurate as they are now, and distances were often overestimated. If measured with today’s techniques, the distance might well have come out closer to 26 miles exactly. The finish of the 1908 Olympic marathon remains one of the most famous in history. A diminutive Italian baker, Dorando Pietri, entered the stadium well clear of the field and staggered around the last lap to the finish line, only to be disqualified for receiving assistance. There was immense public interest in the race, but considerable disappointment that British runners fared poorly. 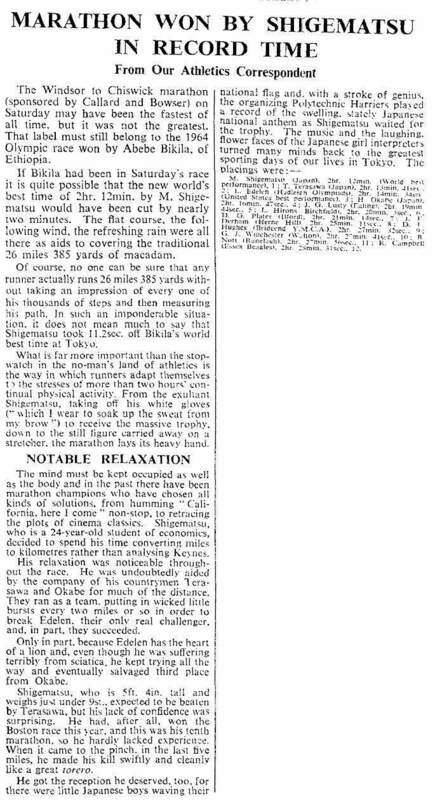 In an attempt to improve matters, The Sporting Life newspaper offered a magnificent trophy for an international marathon that would be second in importance only to the Olympics. The Sporting Life asked the Polytechnic Harriers to organize the event, and the Polytechnic Marathon was born. The first Poly Marathon was held in 1909. As with the Olympic race, the start was at Windsor Castle and the course was 26 miles 385 yards. This distance was adopted as the international standard for marathons in 1924. Over the years, the route of the Poly Marathon varied. Until 1932 it ended at Stamford Bridge in west London, then in 1933 moved back to the White City stadium, where the 1908 Olympic marathon had finished. From 1938 the race ended at the new Polytechnic Harriers stadium in Chiswick, west London. It was here that enthusiastic crowds saw Jim Peters, the greatest marathoner of his day, break the 2 hr 20 min barrier in 1953. In 1961 The Sporting Life withdrew its sponsorship, having ceased to report on athletics. A new sponsor was found in the form of the confectionery company Callard and Bowser, and in the next few years the race went from strength to strength, with a succession of world records (see table). But by 1970 the Polytechnic Harriers and the Poly Marathon were in decline. Traffic problems made it difficult to continue with the Windsor to Chiswick route, and from 1973 until 1992 the race was restricted to the Windsor area. Performances declined, and so did the status of the Poly Marathon. With the introduction of mass marathons and big-money events elsewhere, the Poly Marathon could not compete. There were organizational changes, too. In 1985 Polytechnic Harriers merged with Kingston AC and moved in with them at the Kingsmeadow stadium in Kingston, Surrey. A rump of ex-Polytechnic Harriers remained at the Polytechnic sports ground in Hartington Road, Chiswick, where they formed a new club, West 4 Harriers, which was to become involved with the Polytechnic Marathon some years later. Management of the race passed to the London Road Runners Club (LRRC) for 1986 and 1987, but LRRC then folded. After a four-year hiatus the race was revived in 1992 by Capital Road Runners, an even shorter-lived successor to LRRC, in conjunction with West 4 Harriers, of which I was a member. A revised route was introduced from Windsor to the Polytechnic stadium at Chiswick, recalling the event’s former glory days. From 1993 to 1995 the Poly Marathon was organized by a group from West 4 Harriers, with me as race director, under licence from Kingston and Poly. The number of runners began to build again and times improved. In 1996 we passed on the responsibility to a commercial events organizer, but increased traffic and other difficulties made it impossible to keep the race going beyond 1996. A few stalwarts from West 4 have since run the course to keep the memory of the Poly Marathon alive, but its days as a competitive race ended with its 78th running in 1996. 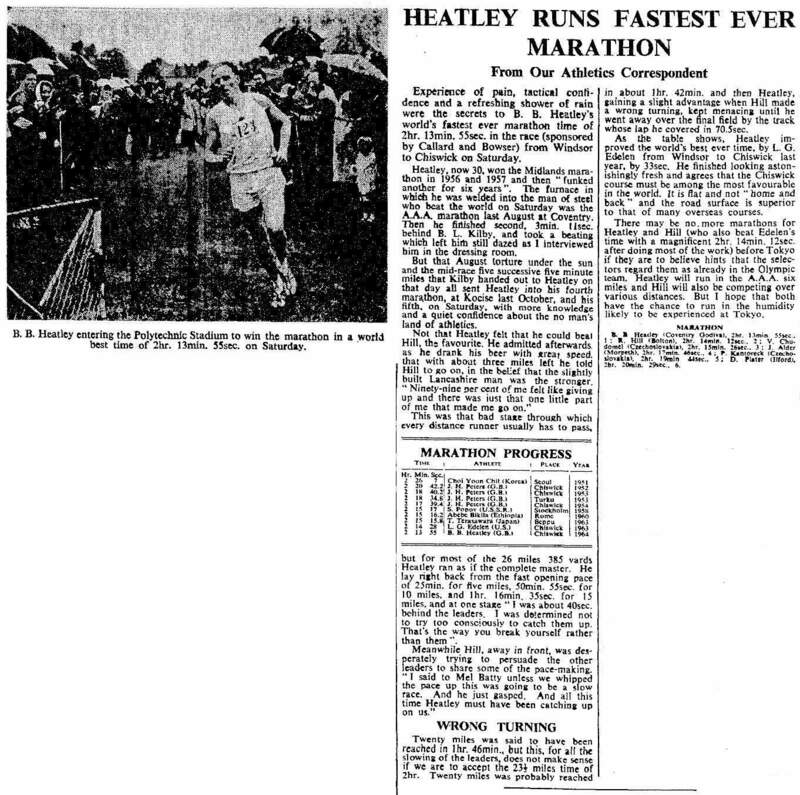 The following eight world records were set in the Poly Marathon, including the world’s first sub 2 hr 20 min clocking, by Jim Peters in 1953, a feat that is regarded as the marathon equivalent of the sub-4-minute mile – and it was done on an over-distance course. 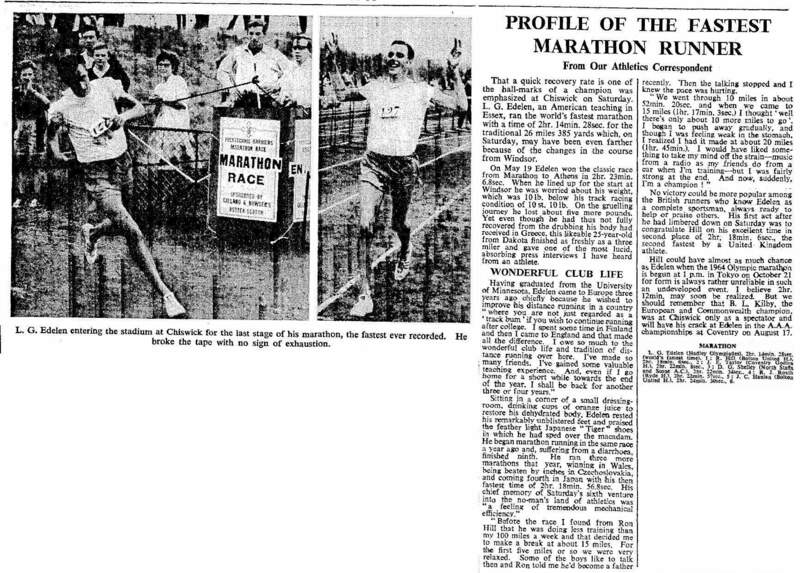 Click on a date to read a race report from The Times archives. Note 1: The first Polytechnic Marathon. Date wrongly given as May 26 in some references. Note 2: Measured as 42.337 km.